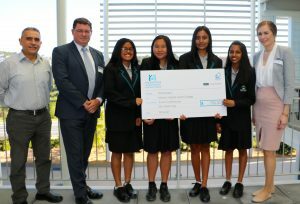 A team of Mission Heights Junior College Year 10 students have collaborated this year to produce an innovative project, earning the group a Merit Award in the 2017 Transpower Neighbourhood Engineers Awards and $750.00 for the school. Jamini Patel, Lia Arroyo, Camryn Chetty and Vanisha Rajan created ‘Robo-ish’ a robot programmed to sense and pickup litter and place it in rubbish bins. The robot stays within a specific vicinity, using claws to move in a random order automatically sensing rubbish on its way, then finding its way to the bins. The project team was so determined to learn the new software of coding the robot and used certain codes to ensure the robot does the required job. The students have used a small-scale robot (MBOT) currently being used for learning about robotics at the school and programmed it to achieve their goals. Special guests Craig Stephens, Consultant for Goodman Property and Sarah Kelly, Civil Engineer, Calibre presented the cheque from Transpower on behalf of Futureintech at the MHJC Champions Assembly this week. Congratulations Team Robo-ish! From left: Craig Stephens, Basil Taha, Teacher Maths & Technology, Jamini Patel, Lia Arroyo, Vanisha Rajan and Camryn Chetty and Sarah Kelly.